When I started gardening, “wildflowers” to the average person meant spring bluebonnets, Indian blanket and confederates like Thelesperma filifolium. For months, my various Turk’s caps, including Pam’s Pink, never relax their appointed task: to feed hummingbirds, butterflies and bees. I love my neighbors who support our unspoken “wildlife neighborhood watch” with their native plants. Hamelia patens, Salvia greggii, and Salvia leucantha that stop traffic until the first frost. I know that bees were all over the salvias, too, but I just snapped these guys on the Hamelia. No doubt the hummingbirds zoomed in when I got out of their way. A few years ago, it was all lawn. One winter, they smothered it with heavy black plastic or tarp for months. After renewing the soil, they installed small plants that quickly filled in. At the Travis County Extension demonstration garden, I lucked into this bee heading to early lunch on Salvia farinacea. Stop by any time to see water thrifty gardens that illustrate how adapted and native plants, along with vegetables and herbs, beautifully work together. One native that’s blooming right now is four-nerve daisy, Tetraneuris acaulis, though I still call it by its former name, Hymenoxys. No doubt that birds go for the seeds. Daphne makes this very drought tolerant native perennial Plant of the Week. Blooming from spring through late fall, four-nerve daisy stays low to the ground. You can tell that it prefers well-drained soil, since it’s happily residing with blackfoot daisy and Yucca rostrata in this no-lawn front yard in full sun. Since precious wildlife eat all year, just like us, Tom joins Andrea DeLong-Amaya from the Lady Bird Johnson Wildflower Center to extend the menu across the months with nectar and seeds. Migrating Monarchs (along other butterflies and bees) love frostweed (Verbesina virginica), blooming right now in the back of a shady strip in my garden. It’s tall, so plant it in back. American beautyberry and my Mexican beautyberry (Callicarpa acuminata) brighten up understory shade with late summer/early fall berries. With all my shade these days, I’m so lucky to have chile pequin for the birds, who snack on them in winter, even when the foliage is dried brown. As Andrea tells us: that’s one of the many reasons not to clean up too fast after the first hard frost. Butterflies like this Red Admiral, go for the nectar (as do bees) on coneflowers. Later, little birds land to snag the seeds. White mistflower (Ageratina havanensis), another for part shade, attracts many pollinators to its white fluffy flowers in fall. Your small birds will thank you if you leave the seeds on until mid-February or so. Then, cut it back severely or to the ground, depending on what winter dealt us. Small birds, including goldfinches, devour aster seeds. Butterflies and other small creatures take cover in grasses, like Lindheimer muhly, here with fall-blooming Salvia leucantha. I love Andrea’s concept of “time-sharing.” When lantana browns up in a “normal” winter, pink evening primrose will fend off the weeds as it brings on the hungry bees. Watch now! You can add to your 12-month smorgasbord at the Lady Bird Johnson Wildflower Center Fall Native Plant sale on Friday, October 14 (members only—but easy to join that day) and October 15. Note: this fall, there is no Sunday sale! Trisha heads to the garden and the kitchen to egg us on with incredible edible eggplant, including Black Beauty, Nadia, and Grafitti. Get her growing and harvesting tips, along with recipes for Baba Ghanoush, grilled eggplant, appetizer, and vegetarian entrée. Her latest book, Vegetable Gardening in the Southwest, answers ALL your questions for growing your best. On tour, Jackie Davis is always throwing a garden party for wildlife. It’s a far different scene than when she bought her small-lot house, complete with dying trees and dog-trampled yard. 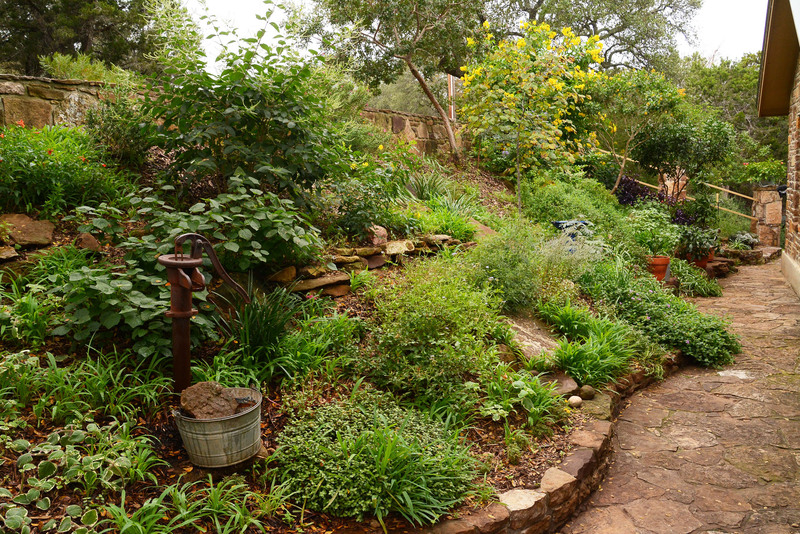 Now her Certified Backyard Habitat is always full of life, including over 110 species of birds. She’s a member of Travis Audubon, the Native Plant Society and the Austin Butterfly Forum.